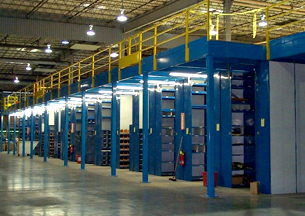 Mezzanines, also known as equipment platforms, are a cost-effective solution to increase your storage or production space by utilizing the existing unused vertical space in your facility. Mezzanines can be installed in high-ceiling spaces to optimize vertical space. These semi-permanent steel structures / platforms are most often more affordable than building renovations. Mezzanines can be installed as freestanding units or attached to an existing wall. Freestanding mezzanines are highly adaptable, as they can be dismantled and relocated as needs change. 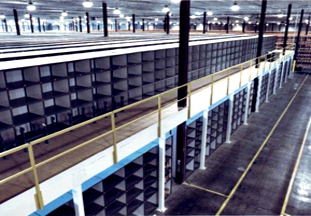 They can be supported by structural steel columns and elements, or by pallet racking or industrial shelving units. It is also quite common to install a modular office on top of a mezzanine, to provide additional office space, lunch rooms, overlook towers, etc. 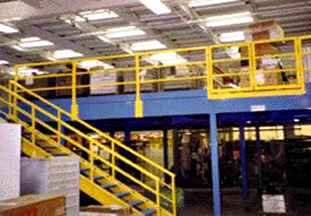 Further Reading: What Are The Top 5 Benefits of Mezzanines? Depending on your needs, they can be constructed as either one, two or three story structures. 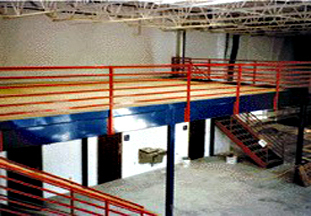 Mezzanine decks can be structured of a variety of different materials depending on its size or span. Common deck options include resin-board, concrete, steel & aluminum plating, and steel & fiberglass grating. 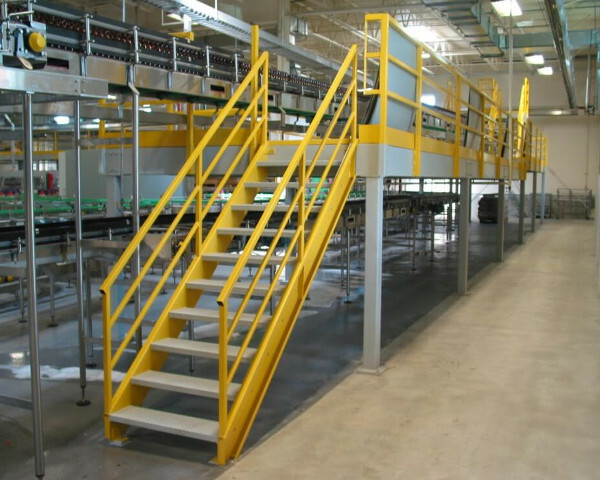 Also known as structural, steel or wide-span mezzanine, freestanding mezzanines are very easy to assemble and disassemble. Their flexibility and adaptability makes them perfect for wide variety of applications. They can be used as staging areas and are perfect for product storage as well. They offer conveyer and modular office support. 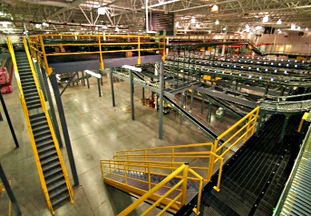 Since these mezzanines are considered capital equipment, they can be depreciated over a shorter period of time to provide tax benefits. Cubic Designs offers Stainless Steel and Food Grade mezzanines & work platforms that offer a different pre-manufactured approach to standard fabrication of mezzanines & work platforms for food and beverage processing operations. Their stainless steel and food grade mezzanines & work platforms combine the benefits of their “standard” bolt together mezzanines & work platforms, with closed-shape framing, to accommodate the many design requirements and Good Manufacturing Practices (GMPs) of the industry. Quick and easy installation, while meeting the USDA, FDA, and AIB auditing food grade requirements, are just a few of the many benefits afforded to food and beverage companies. AS opposed to freestanding mezzanine, building supported mezzanines are supported by the building structure. This is an efficient way to install a mezzanine as long as the foundation of the building can support additional load. 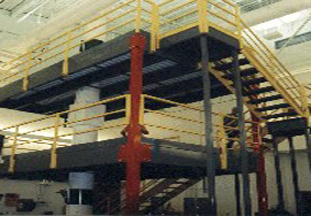 A platform or a mezzanine can be supported with the help of a blended system utilizing support from building as well as additional columns. Rack or shelving supported mezzanines are supported by the pallet racking or shelving units themselves, as they act as the base for the structure. These mezzanines allow you to use every inch of your space to increase storage capacity. Ideal for storing pallets or small items, it is however, not easy to reconfigure once installed. 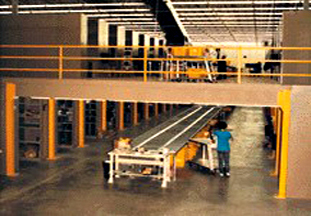 Catwalks can also be installed to make the operations more convenient. 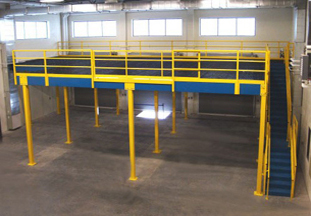 Customized Space: Steel mezzanines can be customized to fit your exact area, height, color, and load requirements. 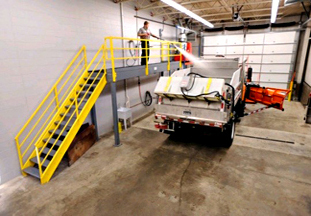 Additional Space: Steel mezzanines can double the space inside a facility by increasing the efficiency of vacant cubes. 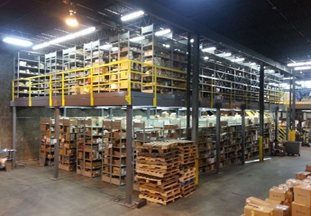 Efficient Space Utilization: You can fit more products and items in the limited space your facility provides, eliminating the need to expand your facility or lease additional space. Inventory Storage: By installing new custom designed racks and other storage structures you can add inventory storage capacity to your facility. Improve Inventory Management – the additional storage space you gain, allows you to better organize your inventory, making it easier to keep track of it. 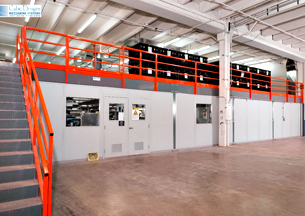 Increased Product Output: More space means increased ability to perform production operations in an effective way. This increases your output and consequently your yields. Meeting Growth Demands: Custom steel mezzanines allow you to meet your growth targets without physically expanding the area of your building. Saving Construction Costs: You do not need to renovate or build additional building structures to meet your increased productivity. 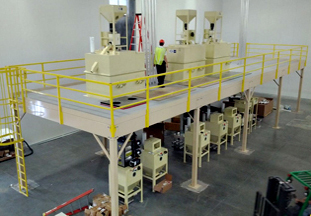 Tax Advantages: Freestanding mezzanines are most often considered equipment, so you can qualify for accelerated tax depreciation. Saving Expansion Related Expenses: You do not need to spend money to rent or lease new facilities to meet your growing needs. You can save your business from additional insurance premiums, property taxes as well as added energy costs by effectively using existing space. One-Time Investment: Mezzanines are a one time investment that is easy to maintain and can be expanded according to your needs and demands. If your mezzanine can be considered depreciable personal property, meaning that it can be moved and/or relocated, the depreciation life is usually 5 or 7 years depending on the industry use. On the other hand, if the mezzanine is considered real property, meaning it is permanently attached to the building, the depreciation life is over a 39 year period. 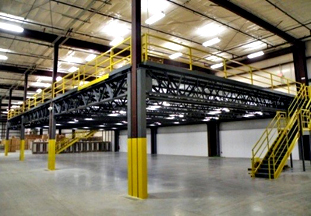 Most mezzanines are considered personal property and quality for the tax advantage.